Margo Dewkett, center, accepts the EQUUS Foundation Humanitarian Award from Lynn Coakley, president of EQUUS Foundation, and John Long, USEF CEO. 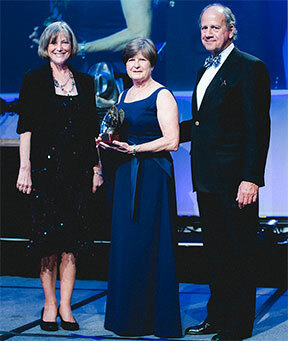 The EQUUS Foundation named Margo Dewkett the recipient of the 2013 EQUUS Foundation Humanitarian Award at the United States Equestrian Federation (USEF) Pegasus Awards Dinner on January 10, 2014. Margo is the executive director and head instructor at Windridge Therapeutic Equestrian Center of East Texas, Inc., a PATH Intl. Premier Accredited Center in Longview, TX. The USEF/EQUUS Foundation Humanitarian Award is a celebration of the humanitarian achievements made by a member of the equestrian world. From improving the health and welfare of the horse to promoting and expanding the general public's appreciation and respect of the diverse roles of horses, the recipient of this award has devoted considerable personal time to making the lives and quality of life of our equine partners paramount. Congratulations, Margo! It is a well-deserved award. Individuals interested in presenting at the 2014 PATH Intl. 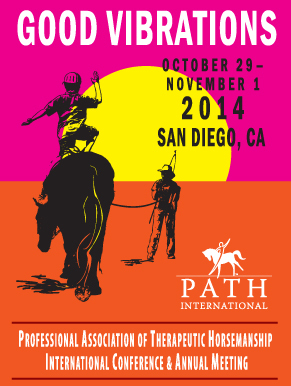 Conference October 29 - November 1 in San Diego, CA, are invited to submit a completed abstract submission form to PATH Intl. Abstract submission for pre-conference and sessions on Thursday and Friday will be handled electronically only. Abstract submissions for the PATH Intl. Horse Expo will be handled by email. Individuals interested in presenting at the 2014 PATH Intl. Conference must submit the completed abstract submission form to PATH Intl. by March 14, 2014, 11:59 p.m., Mountain Daylight Time. No abstracts will be accepted after this date! The PATH Intl. Health and Education Advisory will select speakers for the sessions from the abstracts submitted. General conference applicants must use the abstract submission method found here. PATH Intl. Horse Expo presenters, information will be coming soon. Equine worming recommendations have significantly changed over the past several years, and your veterinarian should be consulted for appropriate advice for your horses and your area. The American Association of Equine Practitioners website is also a very good resource for suggested worming protocols. Because of built-up resistance to anthelmintics (dewormers), veterinarians have most recently recommended doing rotational worming throughout the year versus daily worming. Click here to see suggested schedules. The deadline to renew your center was December 31, 2013. Renew as soon as possible in order to avoid a lapse in your center membership. You must include a $50 late fee with your renewal. If you prefer to send in a hard copy renewal, that is still an option. Download and complete the center renewal booklet and renewal invoice, and mail it in.